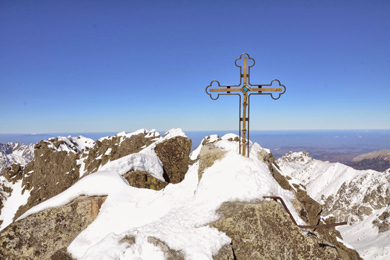 Gerlachovsky Peak is the highest mountain in the High Tatras, Slovakia and the whole Karpat massive. 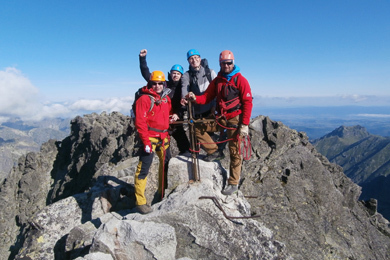 Thanks to its hight, ease of access and beautiful scenery it is one of the most climbed peaks in High Tatras. However, the climb is only permitted with fully certified (UIAGM) mountain guide. Gerlachovsky Peak ascent is a full day climb/trip that is doable during any seasons, however, all depends on current conditions. The peak is reachable via couple of routes of various difficulty. 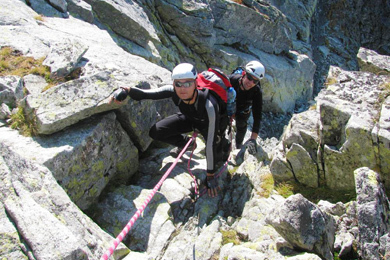 Our mountain guides will happily take you on any of them, depending on your skill and comfort levels, of course. Due to its relatively low level of difficulty the most popular ascent route leads through Velicka Proba. For those more experienced and adventurous we recommend climbing Gerlach via Martinovka or Dzipsiho Ferata routes. We start all Gerlach ascents from Sliezky Dom, and all of them provide spectacular views. The first visitors to Gerlachovsky Peak area and the peak itself were hunters and botanists, and it is quite possible that some of them reached even the summit. The first proved person to stand atop Gerlach, in 1834, was a Spis-German mountain guide Ján Still (1805 – 1890) who at the time was a teacher in the village of Nova Lesna. He was accompanied by his brother in law, Gellhof (a builder from Velka), a miller Martin Urban Spitzkopf, and two unknown chamois hunters. The first Slovak ascent was completed in 1875 via Batizovka Proba by mountain guides from Stola – Ján Ruman Driečny ml. a Ján Pasterňák.